There are many different ways to celebrate a 25 years career. Recording a live ? A difficult choice for Saxon considering they have already released two lives The Eagles Has Landed I & II (1982/1996). A best of ? How could a song of 1979 compete in terms of sound and/or production with a track recorded back in the 90's. Difficult again. "So how we celebrate our 25 years guys ? What about re-recording our best classical songs ? Yeah why not, but isn't it dangerous to 'play' with our songs as Biff's vocal has quite changed and considering these old songs are printed forever in the mind of our fans the way we recorded them at that time (feeling, fashion, emotion, studio sound ...). I think it would be a difficult, a very difficult task to reproduce exactly our classics ... with the same intensity we did on the original one. I see more chance to fail than to succeed". I suppose this is the type of dialogue that took place inside the band. At the end, I think this difficult challenge drives Biff and the band to re-record their classics with today's technology (new studio, new sound and new production). A very risky choice, believe me ! Saxon's fans (like me) would not accept a single note, a single "new" vocal pitch here or there. What seems almost impossible and very risky, turns to be a wonderful achievement. 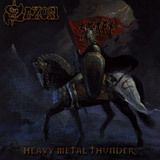 This is the ultimate Heavy Metal Thunder album. Every classic is executed here at the perfection timing, the prefect feeling, the "small touch" here or there that make this particular classic a f*cking great song ! The second CD is less interesting as the official bootleg recorded live in San Antonio badly contrast with the first CD : poor sound, poor production. The only interesting thing (at least for me) is the video track recorded at Wacken 2001 : Killing Ground. That was the first song of the set-list, that was our last year camping adventure. This is a wonderful souvenir, a wonderful feeling to see Biff and the band "reproducing" what I saw with my eyes ... live. As the second CD is in fact a "bonus CD", there is nothing to blame on (2CDs for the price of 1). If you still don't know this band - hang yourself man - jump on this record NOW. And if you though these guys are too old, I highly suggest you check Heavy Metal Thunder. The first CD - full of 13 classics - is running here in my player since a month and the band ... plays on.